New York, NY – During a special presentation at Citizens Business Bank Arena, streamed live via the official GLORY Facebook page, the world’s premier kickboxing league today announced the formation of a women’s super bantamweight division, carrying a limit of 122 lb / 55.5 kg. In order to crown GLORY’s inaugural super bantamweight champion, the organization will hold a Grand Prix tournament, playing out over multiple events. The Grand Prix’s first quarterfinal bout will unfold tomorrow, May 13, on UFC FIGHT PASS as part of the GLORY 30 SuperFight Series in Los Angeles, as Tiffany “Time Bomb” van Soest (14-2-1, 5 KO) comes home to California for her GLORY debut against Dutch-stylist Esma “Fight Queen” Hasshass (9-2, 3 KO), fighting out of Morocco. Eight other super bantamweights will join Van Soest and Hasshass on the GLORY roster. Fighting in Amsterdam on June 25 at GLORY 31 SuperFight Series, 21-year-old prospect Isis Verbeek (8-2, 5 KO) of the Netherlands takes on muay thai phenom Iman “Pretty Killer” Barlow (83-5-3, 25 KO) of England in the second announced Grand Prix quarterfinal bout. Three additional Grand Prix match-ups were announced for later this year, but exact dates and locations have yet to be revealed. Comprising the final two quarterfinal bouts, former Bellator MMA strawweight champion Zoila “Warrior Princess” Frausto (4-0, 2 KO) will meet German boxer Daniela Graf (23-4-1, 2 KO), while World Kickboxing Network (WKN) world champion, undefeated Amel Dehby (27-0, 11 KO) of France battles Korean muay thai champion Ji-Waen Lee (13-2, 3 KO). 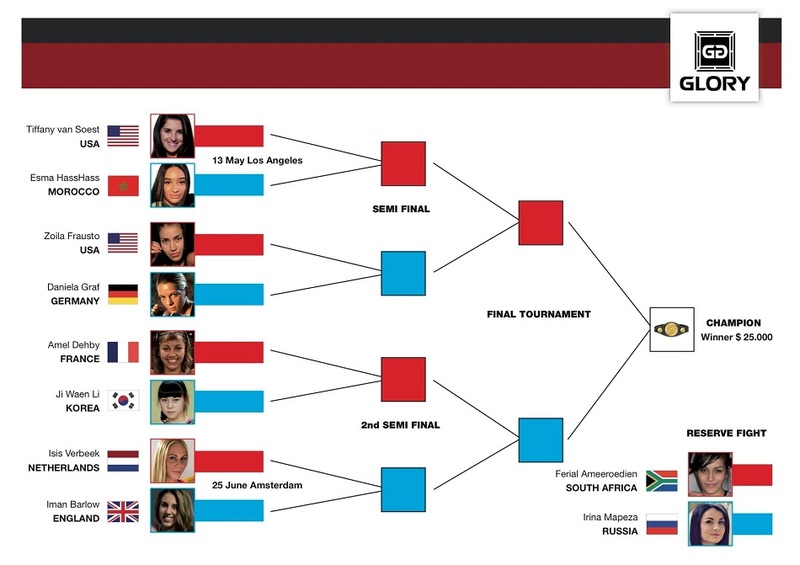 South Africa’s Ferial “Felix” Ameeroedien and Russian veteran Irina Mazepa will square off in a tournament reserve fight. In addition to the prestige of holding GLORY gold, the Grand Prix winner and inaugural super bantamweight champion will earn a cash prize of $25,000. Looking forward to this. A lot more than Cyborg vs. Smith. Will it be televised, and if so, where?